As a Navy guy, I am glad our sister service has received the budget flexibility to restore flying hours to the front line combat Air Force. Pilot skills are perishable. I would rather have those who fly with us in the Joint arena be up to the mark. Given the state of affairs today, we cannot count on having several months for work ups if those skills are allowed to decay. It's very important we get our multi trillion dollar air force flying again so we can spend our money on nothing some more. My family and I went to see the show in Nov 2012 I believe, and it was amazing my kids always talks about it, My father in law also is retired from Thunderbirds. I guess some people would sooner spend millions so the so called first lady can have more vacations. moving money around within their budget.208 million.guess there is a little extra cash floating around. A very welcome move indeed (the photograph of flying strikingly painted F-16s seem to celebrate it). Hope the United States government also reconsiders to hold the highly prestigious Red Flag air combat exercises at Nellis AFB, Nevada where the Indian Air Force was invited to participate. 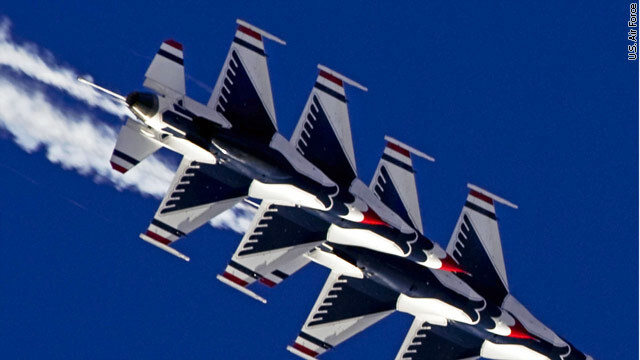 See more imagery here: http://afthunderbirds.com/site/category/media-gallery/ or follow us on Instagram, Twitter, Facebook and YouTube. Thanks for the support!